WHAT IS SO BAD ABOUT GRAINS? I am not saying grains are bad for everyone. In fact, if there was not a steady consumption of grains worldwide, based on current food production rates, it would be impossible to feed the billions of people that populate our planet. What I am saying is some people have bodies and digestive systems that struggle to process them, causing damage to the system and restricting the growth of healthy bacteria in the gut. Most people started consuming grains from the earliest stages of life, beginning with rice based cereals at 4-6 months old. This is before their little bodies are mature enough to produce the necessary starch splitting enzyme amylase. When these babies become toddlers they are often bombarded with prepackaged grain based snacks and convenience foods, like puffs, piles of pasta and crackers. It simplifies mealtime when some breaded chicken tenders or fish sticks are gobbled up by little fingers. In elementary school the quickest, cheapest breakfasts are grain cereals and for lunch a bag of chips, cookies and a sandwich. This may read as a criticism of parenting decisions, which is not my intent. I grew up eating like this, and today, surrounded by my daughter’s friends and other young children, I know it is still a very typical approach. My intent here is to highlight the prominence of grains in America’s food culture. Most American diets, fad or otherwise, either highly value or condemn grains. There is rarely a middle ground. As these children get older, habits and tastes from early childhood become the habits of adults. Adult metabolism slows and the gut damage begun in childhood steadily increases. For anyone who has experienced the impacts of gastrointestinal disease, auto immune disorders or allergies, they are widely varied, uncomfortable and often painful. The cumulative effects of grain consumption is glaringly evident when grains are removed from the diet. Oftentimes, removing grains from a diet result in significantly reducing the persistent inflammation and irritation from the conditions, providing relief to sufferers. Besides the biological effects, these grain-based eating habits from an early age instill an emotional desire for classic American comfort foods, which are generally defined as containing high levels carbohydrates and/or sugar. Foods like pancakes, grilled cheese sandwiches, pizza, macaroni and cheese or pie often fall into the category. The are full of highly processed grains/carbohydrates that can irritate the previously mentioned gastrointestinal and autoimmune disorders. If grains are being avoided it may be assumed such comfort foods must also be spurned, but it does not have to be true. By using the right ingredients in the right combination you can have grain free versions of your beloved comfort foods. In my personal experience, my longing for such foods is two-fold. The first is based on the taste of the comfort foods, and thankfully, much of the flavor of such foods come from grain free elements. Thank goodness! The second element I miss can be harder to duplicate, which is texture – grains definitely make it easier to create crispy, crunchy, gooey, flaky…. Since the flavor aspect was significantly overcome I knew the next step was to tackle the texture challenge. I knew I could do it and now spend a large part of my time sharing my successful results. Those results are nutritionally dense, filling, healthy meals. They include options that are indeed crispy, crunchy, gooey and flaky. They are succulent, sweet, spicy and savory. Meals that can be made in advance, snacks at the ready for the entire family, and staples that can be relied on for any meal. It has taken years for me and my family to figure it all out, but it was worth every minute. Our digestive systems now function like clock work, my husband’s gastrointestinal problems are in check, our daughter is contentedly growing like a healthy, robust weed, and my symptoms from Polycystic Ovary Syndrome are much more under control and accomplished without medication. To ease your path to eating grain free I encourage you to explore my world. Between my food blog, Any Kitchen Will Do, and the products offered by Grain Free Haven it is is possible to enjoy delicious, comforting dishes while avoiding grains. If you have not yet come by our booth at the Pearl Brewery Farmers Market to sample our products, please take some time one weekend soon and say hi! Also feel free to call or send a note if you have questions. I am constantly experimenting, so if you have any ideas or challenges to present to me I am ready to hear them! 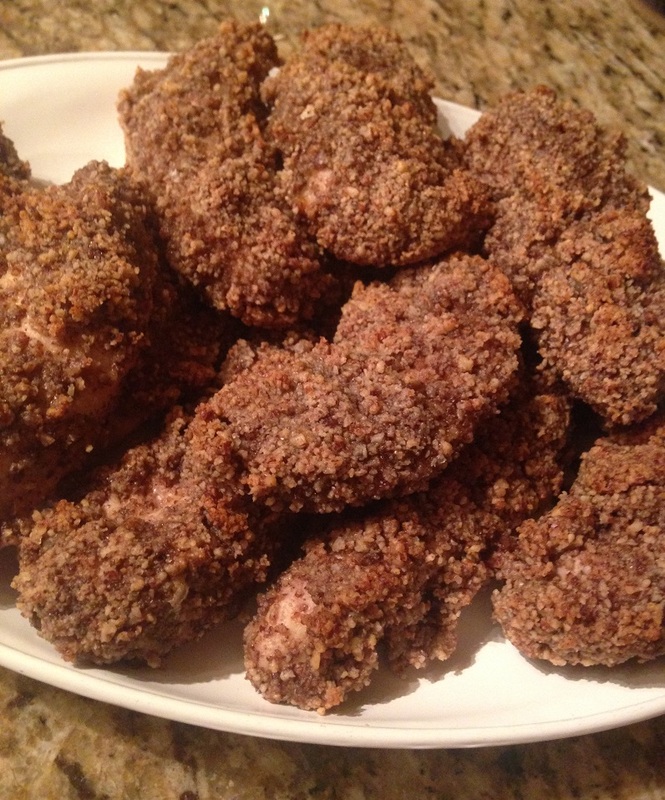 These chicken tenders are a great substitute for the more traditional wheat flour based breaded tenders. They freeze well after being cooked, so you can stock up for quick weekday dinners. The pecans in the crust also add protein and fill up the family more quickly! In a food processor pulse pecans (and almond meal if used), salt and garlic powder until nuts are finely chopped. In a medium bowl whisk together egg whites and mustard until well combined, but stop short of the whites becoming stiff. Line one to two shallow baking sheets with aluminum foil. Spread the nuts on a third sheet or large plate. Generously season chicken with salt and pepper. Dip the chicken in the egg wash, letting the excess run off. Roll chicken in the nuts, gently pressing them into the meat. Place chicken on the foil lined baking sheets with about an inch between pieces. Bake for 35-45 minutes, until juices run clear (whole chicken breasts or bone-in chicken may take longer). Serve immediately, plain or with desired dipping sauces. Note: the leftover egg yolks are perfect for making a fresh batch of blender mayonnaise and/or hollandaise sauce. Saturday, July 9, 2016, 9am – 1pm: Pearl Brewery Farmers Market. We are making sure we have plenty of Coconut Macaroons and Peanut Butter Chocolate Chip Cookies for everyone! Come by and grab a snack! Also, we will have some lovely muffins with some fresh ingredients from the Market’s produce vendors. Samples will be ready and waiting for you! Sunday, July 10, 2016, 10am-2pm: Pearl Brewery Farmers Market. Bring along any of your friends that are grain or gluten free. We can chat about what products best fit your dietary needs and make life a little easier. Don’t forget to grab some savory Momma’s Pecans. A small handful will take care of your mid afternoon nibbles! If you come by my booth and tell us this week’s discount code you will get $1 off any purchase! The code for this week is PEARL! Please feel free to forward and share this newsletter with anyone you like! We look forward to seeing you this weekend! Sign up for weekly discounts!